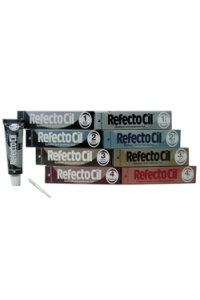 RefectoCil Bleaching paste No. 0 blond lightens eyebrows by up to 3 levels:- To match too prominent ..
Waterproof, smudge proof, clump free. Ideal for sports, outdoors and vacations. Practical for c..
Refectocil No. 1. 1 Graphite is suitable particularly for eyebrows turned grey. This shade discreet.. The creamy alternative to the liquid oxidant. A stabilised, creme based and subtly fragranced deve..
Refectocil Eye Protections Papers protect the lower eyelids against unwanted staining. Pre shaped f..
Refectocil No. 1 Pure Black is the classic colour amongst the eyelash tints - irrespective of the c..
Refectocil Eyelash and eyebrow tint No. 2 Blue Black is a black colour with a blue lustre providing..
Refectocil No. 3 Natural Brown is a very dark, well covering brown tone suitable for dark eyelashe..
Refectocil No. 3. 1 Light Brown is suitable to discreetly emphasize light blonde to light brown eye.. Whether Chestnut, Mahogany or Copper, red is at present the trendy hair colour. So far, clients .. Hair colours in strong, intense red tones are very popular. However, customers were frequently no..